Vanity Fair: Fox on the Rocks; Glenn Becks Despised by Network President, Other Employees, by Juli Weiner, September 29, 2010. New York Times: Being Glenn Beck by Mark Leiobevich, September 29, 2010. 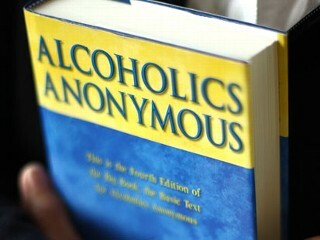 Just goes to show that AA just helps you get sober; it doesn’t necessarily make you a better person. This entry was posted in AA, success and tagged christianity, television personalities on September 29, 2010 by buzzer. More than 70 years after the publication of the Alcoholics Anonymous “Big Book,” which provides the framework for the AA program including the twelve steps, Hazelden is publishing the original manuscript as written by co-founder Bill Wilson. This original manuscript contains far more and more overt references to Christian doctrine than the originally published version, which was intended to reach a more diverse religious audience. While some criticize the existing AA program as presented in the published literature as being far too Christian already, this new publication shows the original thinking behind the program. This entry was posted in AA, literature and tagged 75th anniversary, bill wilson, christianity, higher power, religion on September 24, 2010 by buzzer.